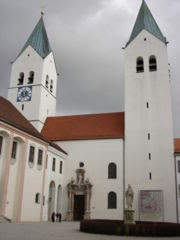 Excessive use of incense brought out the fire brigade to the Roman Catholic cathedral in Freising, police in the southern German state of Bavaria said Sunday. Cardinal Friedrich Wetter, the archbishop emeritus of Munich, was leading an evening service Saturday to mark the patron of the diocese. The congregation was met by the fire brigade as they emerged from the cathedral walking in a procession with the remains of St Corbinian. The incense had set off an alarm in the cathedral. Police were informed and they called the fire brigade.